Mini or maxi, shorts or tights? Our training will help you make an impartial choice. Of course, to make your legs look slimmer, you can get on your heels. But, firstly, why look for easy ways? Secondly, how then to live with lovers vetnamok? To really be proud of the beauty of the body, you have to work on it. If you add high intensity cardio intervals to this training, you will kill the second rabbit - cellulite. Especially if you spend a lot of time in a sitting position, your bottom inexorably changes the configuration for the worse: the hip joints lose mobility, and the gluteal muscles - the force. So heels can not save. But our complex is easy! These four simple movements will make the legs slimmer and rearrange the rear view. Do three or four times a week, doing two or three sets of each exercise. Stand up facing a bench or a step slightly taller than your knees and put your left foot on the "pedestal". Keep your back straight, your hands on the sides (A). 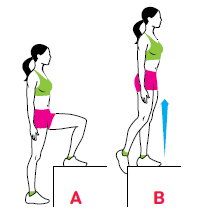 Straining the left hip and not pushing from the floor, rise upward, almost completely straightening the supporting leg (B). Go back smoothly. Do eight to ten steps with each limb, alternating them through repetition. Stand up facing any fixed object, located at the chest level, firmly grasp it with both hands. Make a sweep straight right foot to the right and as high as possible (A). Immediately return it back and, without stopping, make a swing to the left side (B). This is one repetition. Run them 12-20. Then the same with the left foot. Stand upright, feet on the width of the thighs, hands to lower on the sides (A). With your right foot, make an attack diagonally - forward and sideways, without changing the position of the hips and without bending the left (B). Go back to the starting position and execute a lunge in the other direction. In total, you should get 10-12 repetitions for each leg. Lie down on the floor, bending your legs at right angles. Knees and feet are held together, hands - along the body on the floor (A). Raise the pelvis up until the body - from the knees to the shoulders - is stretched out into a straight line (B). Hold a two-second pause and return to the starting position. Do 12-20 repetitions.